I expected Saigon to be a small city, dusty and provincial, the impression I got from watching ‘the Amazing Race’. However, when I arrived, it was totally not what I expected. The city was big and drenched in bright lights. According to our guide, decorative lights were put on city streets for the Chinese New Year, but left for other holidays, if not for the rest of the year. We arrived late in the evening, so I settled for a Banh Mi (Vietnamese sandwich) that was delivered to our hotel for dinner. That simple Vietnamese sandwich tasted so good, different from the Vietnamese sandwiches I had in California that it made me say, "I'm in Vietnam, indeed!" The following morning, I joined the half-day tour of Cu Chi Tunnel, a war memorial park. It was about forty-five minutes drive from the city of Saigon. After watching the documentary about the 120 kilometers of a complex network of tunnels used by the Viet Cong during the Vietnam war, I sort of envisioned Cu Chi to be a not-so-pleasant place to visit. However, the War Memorial Park was a well-organized tourist attraction, complete with cottages used for informational talk before the actual tour. I thought we would be crawling a long tunnel so I came prepared with mosquito repellant and bottled water, but we were just shown the hidden entrances to the tunnels used by the Viet Cong soldiers as hiding spots, communications and supply routes, food and weapon storage, and living quarters. We were given the option to experience crawling a very small portion of the very narrow tunnel. The graphic display of how a soldier could be trapped in the tunnel with no escape and stare at a weapon being pointed at him/her, made me emotional. A park official showed us the different types of booby traps and demonstrated their mechanism. The gun fires from the firing range seemed to provide the sound effect to the display of weaponry (M16 rifle, AK-47 and M60). It was not my kind of tourist attraction at all. I was hoping to return to the city before noon, so I could find and have lunch at the ‘Lunch Lady’ place featured on Anthony Bourdin No Reservation. But on our way back to the city, we stopped by the rubber tree plantation. My stomach was growling by the time we arrived in the city. I was so hungry that I did not have the time to go looking for the 'Lunch Lady'. I settled for a pho at Pho 24 closest to my hotel. Pho 24 looked relatively modern. There was a choice of “Australian beef”, chicken, pork and vegetarian. I ordered the beef pho. My pho came in a medium-size bowl with a clear, flavorful broth and slices of beef and very fresh basil, mint, spring onions and lime on the side. It really tasted good and better than the many pho's I have had, particularly from the Silicon Valley area of California. After lunch, I joined a walking tour. It was a good way to learn how to cross the streets with waves of motorbikes going in different directions, and to get some sense of history of the place. Ho Chi Min City started from a small fishing village to become the capital of the Republic of Vietnam and the most populated in Vietnam, ravaged by wars and now again a sprawling metropolis. Ho Chi Min City has gone by different names through its long history. I call it Saigon as what most Westerners still refer to it. Saigon has a long history that I would not even try and write about it in this blog. So, let me just say that nothing was more evident of the city’s history than the French colonial influence. We visited the Opera house, the Notre Dame Cathedral and the post office. I had worked up an appetite after the walking tour, and was so looking forward to exploring the food scene for dinner. I met up with H and A (a young couple I met on the flight from San Francisco to Cambodia/Vietnam) for dinner. A typical foodie, H had mapped out and checked out the rating of the eating places that they wanted to try. I, too, had a list of Vietnamese food that I wanted to try. We braved crossing the ocean of motorbikes and after walking a few blocks, we found the restaurant recommended by Trip Advisor, but it was closed for the day. H's eyes were glued to his smartphone (yes, he had a portable Wi-Fi) trying to find other highly rated restaurants. We then headed to Wrap and Roll. 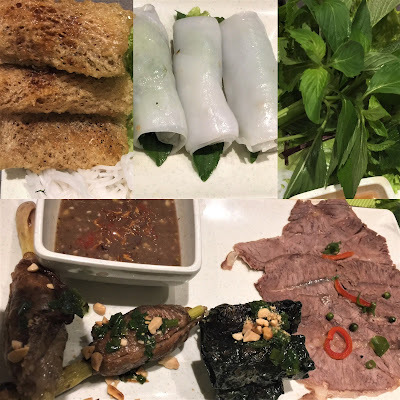 We wanted to try everything listed on the menu, so we ordered everything from the menu, that included grilled slices of beef, fried shrimp spring rolls, fresh spring rolls, pork wrapped in leaves, pork wrapped lemongrass, etc. Two items on the menu were no longer available as they ran out of ingredients to make them. I was disappointed, but glad to know that the foods there were made from the freshest ingredients. Each order was served in small portion (e.g. 4 pieces of spring roll) that came with fresh greens (basil, mint, lettuce, arugula-like leaves with lemony taste), noodles, sauces and wrappers. Our server noticed that we ate our food as they arrived, so she tried to demonstrate how to wrap and roll using chopsticks. The total cost, including drinks (1 beer, 2 glasses of lime juice and fruit smoothie) was less than $30.00 for four people. The meal we had from Wrap and Roll was satisfying, but H, the ultimate foodie wanted to explore other places after Wrap and Roll. We followed his lead and ended at the urban-hip-looking restaurant with outdoor seating, but we could not get in because the place was packed. We did not pursue looking for another place to eat as it was getting late (most business establishments, including restaurants in Vietnam close before 9pm). I returned to my hotel in Saigon Square quite satisfied with the food I had from Wrap and Roll. Before retiring to bed, I ate the mango and cherimoya I bought from the open market earlier. I then look over my window to see the brightly lit Saigon Square. It was quite lively. I showed our guide the picture of buon cuon that my friend posted on Instagram and described as the best meal he had in Vietnam, When I asked where I could find it, he said, “Not here in Saigon, wait ‘til Hanoi”. Apparently, each city in Vietnam takes pride in their specialty food. My dining experience in Saigon may not be that unforgettable, but it sure lived up to the Vietnamese food hype. Ho Chi Min City was nice. It’s a big city with bright lights alright, but during the day, the trees and green parks gave it a chilled-out vibe that seemed to ignore its massive size. 1. I have no material connection to the restaurants, brands or products mentioned in this blog nor received any compensation for writing this post.